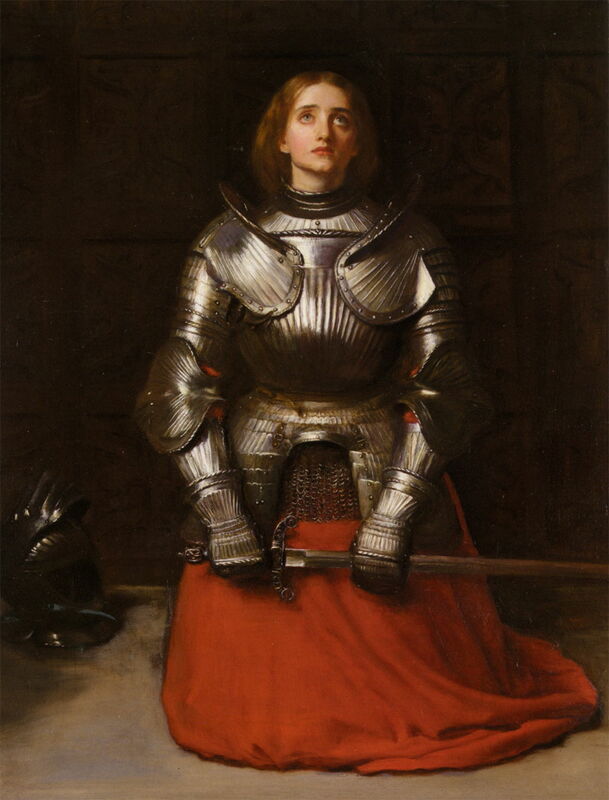 John Everett Millais (1829–1896), Joan of Arc (1865), oil on canvas, 82 × 62 cm, Private collection. Wikimedia Commons. In the previous article, I gave a brief summary of the life of Joan of Arc, and looked at some paintings showing her visions, which resulted in her being called to help the Dauphin of France, its future King Charles VII, defeat the English who controlled much of northern France at the time. This concluding article looks at paintings showing Joan’s subsequent life, up to her execution on 30 May 1431. A few artists have painted series to tell this story. Probably the most accessible is that in the Panthéon in Paris, by Jules Eugène Lenepveu, shown in the next four images. Jules Eugène Lenepveu (French, 1819-1898), Joan of Arc Murals 1 (1886-90), mural, Panthéon de Paris, Paris. Image by Tijmen Stam, via Wikimedia Commons. Lenepveu’s first scene shows the calling of Joan, who appears older than her thirteen years. As with several of the paintings in the previous article, she looks surprised, away from the angelic vision which we can see behind her. She is tending the family’s flock of sheep, although this could be effectively in the ‘garden’ too. She has been spinning, and still holds her distaff in her left hand. Her spindle has fallen to the ground in front of her. The winged angel behind her appears to be female, and is passing a sword towards Joan’s right hand. Also behind Joan is an older figure who is shearing one of the sheep. Jules Eugène Lenepveu (French, 1819-1898), Joan of Arc Murals 2 (1886-90), mural, Panthéon de Paris, Paris. Image by Tijmen Stam, via Wikimedia Commons. 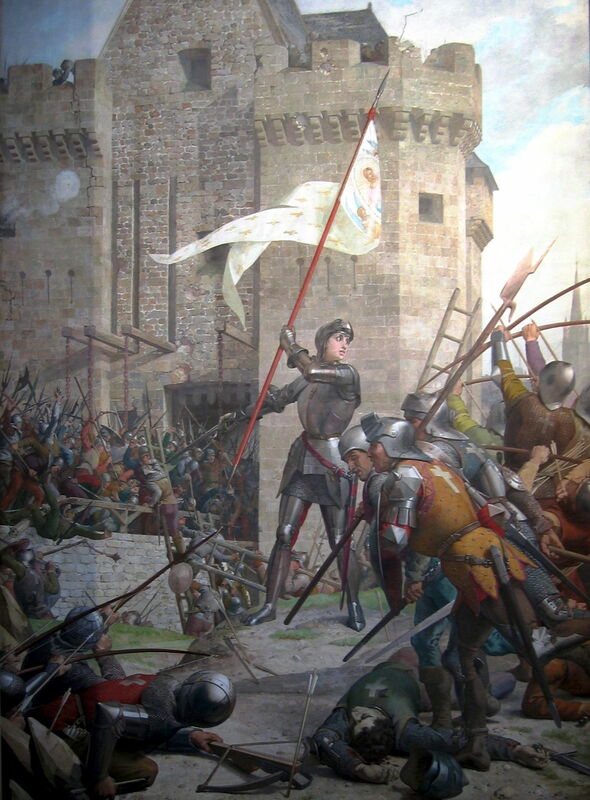 The second scene shows Joan leading the French forces against the English, who were laying siege to the French city of Orléans. There had been controversy in Joan’s trial as to whether she had used weapons against the English; Lenepveu hedges here, showing her holding a sword in her right hand, but brandishing the Dauphin’s standard to rally the French, in the role which she described of herself. She is wearing a suit of plate armour, which she was provided with in preparation for this operation. As this would have been designed to fit a man, this was part of the case against her for ‘cross-dressing’ in men’s clothes. 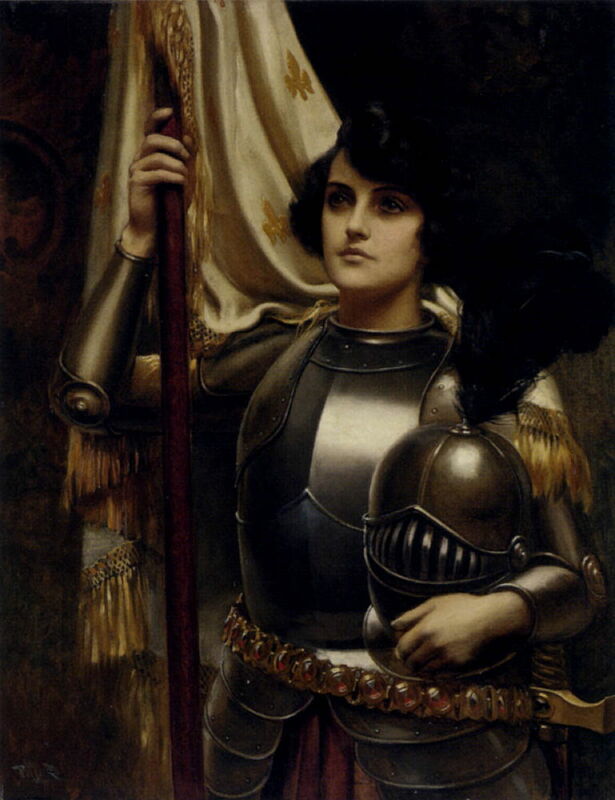 Jules Eugène Lenepveu (French, 1819-1898), Joan of Arc Murals 3 (1886-90), mural, Panthéon de Paris, Paris. Image by Tijmen Stam, via Wikimedia Commons. 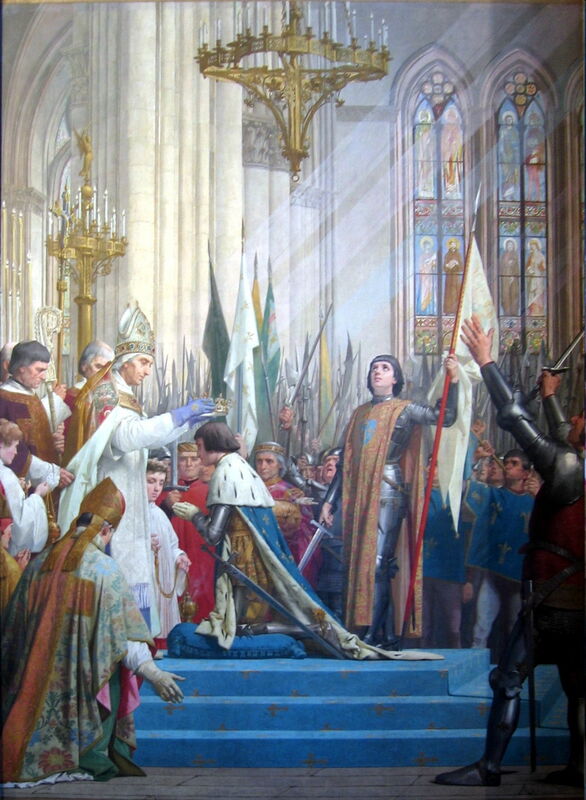 The third scene is of the coronation of King Charles VII in Reims Cathedral. The King is here just about to be crowned, as Joan stands to the right, looking up to heaven, and holding the same sword and standard as at Orléans. Enabling this moment was Joan’s supreme achievement. Jules Eugène Lenepveu (French, 1819-1898), Joan of Arc Murals 4 (1886-90), mural, Panthéon de Paris, Paris. Image by Tijmen Stam, via Wikimedia Commons. The final scene is inevitably Joan’s execution in Rouen, as she kisses the crucifix passed to her. Additional bundles of firewood are being heaped around her, and a brand is already lit and ready to set fire to the wood as soon as the priest has stepped clear; Joan had asked Fathers Martin Ladvenu and Isambart de la Pierre to do her that service. 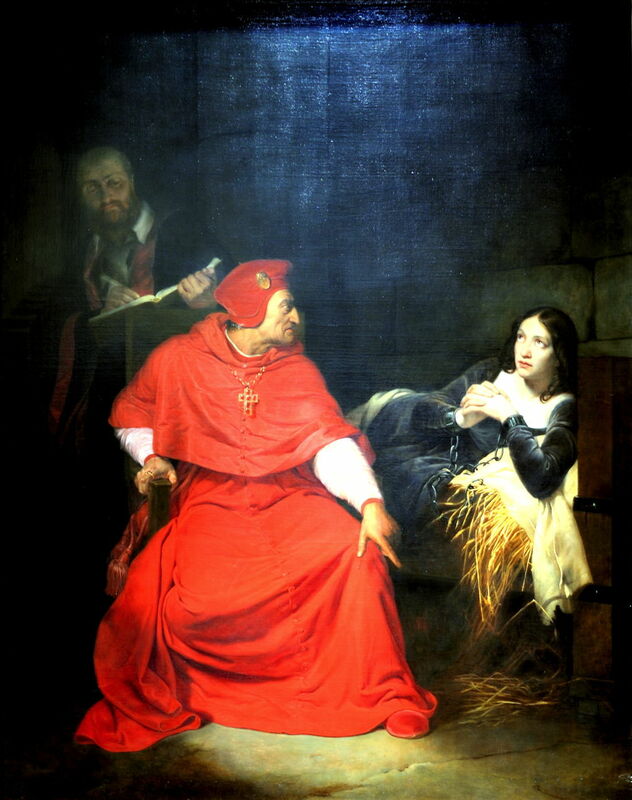 Paul Delaroche (1797–1856), The Sick Joan of Arc is Interrogated in Prison by the Cardinal of Winchester (1824), oil on canvas, 277 x 217.5 cm, Musée des beaux-arts de Rouen, Rouen, France. Wikimedia Commons. With the increasing interest in Joan and the partial legends about her, Paul Delaroche painted The Sick Joan of Arc is Interrogated in Prison by the Cardinal of Winchester in 1824. Delaroche puts the two central figures of the Cardinal of Winchester, as interrogator, and Joan of Arc, as prisoner, facing the viewer. But the Cardinal’s gaze is directed at Joan, and she looks dreamily up to heaven, her manacled hands clasped in prayer. A figure in the background gloom makes a written record of proceedings for the subsequent trial. Hermann Stilke (1803–1860), Joan of Arc in Battle (1843), centre panel in The Life of Joan of Arc Triptych, oil on canvas, 135 x 146 cm, Hermitage Museum Государственный Эрмитаж, Saint Petersburg, Russia. Wikimedia Commons. 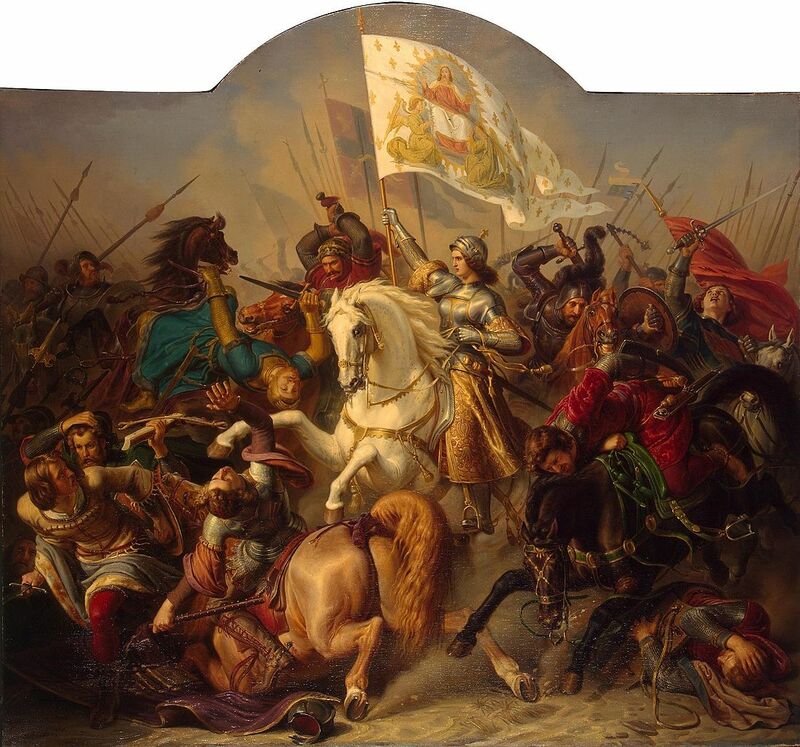 In 1843, Hermann Stilke painted a fine triptych showing scenes from her life, in which Joan of Arc in Battle forms the centre panel. Joan is shown in the middle of a cavalry mêlée in which real weapons are being used in anger to kill and maim. She does not ride side-saddle, but astride her white charger, wearing armour made for a woman, and holding only a standard, no weapons. Jean Auguste Dominique Ingres (1780–1867), Joan of Arc at the Coronation of Charles VII, in Rheims Cathedral (1854), oil on canvas, 240 x 178 cm, Musée du Louvre, Paris. Wikimedia Commons. 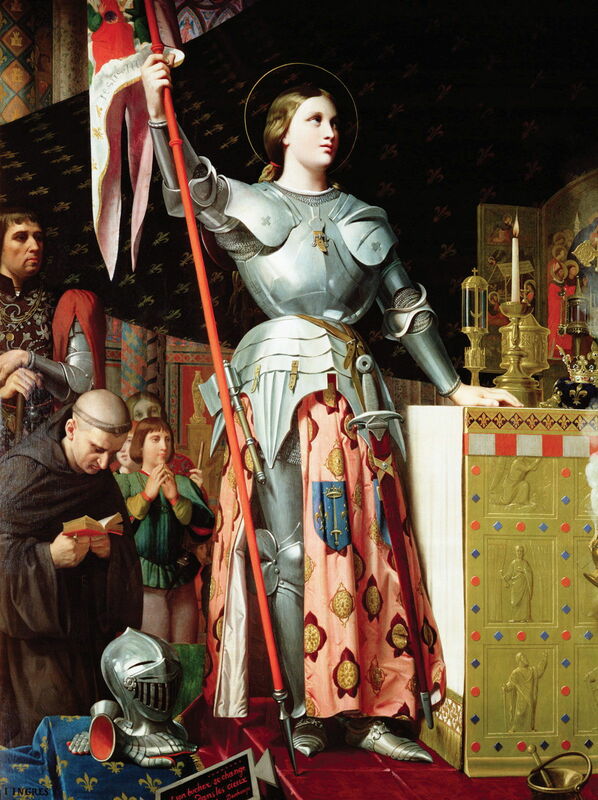 Jean Auguste Dominique Ingres chose to paint Joan of Arc at the Coronation of Charles VII, in Reims Cathedral (1854). She stands close to the crown, resplendent in full armour and holding a standard, the two-pointed oriflamme embroidered for her by the women of Orléans, in her right hand. Rather than covering her head, her helmet (and armoured gloves) have been removed and placed by her feet. Her armour appears to have been tailored for a very contemporary and fashionable figure, with a tiny waist. She carries a large sword by her left leg, and an axe on her right hip. Ingres also accords her a fine halo. et son bucher se change on trône dans le cieux (and in heaven, her stake is transformed into a throne). 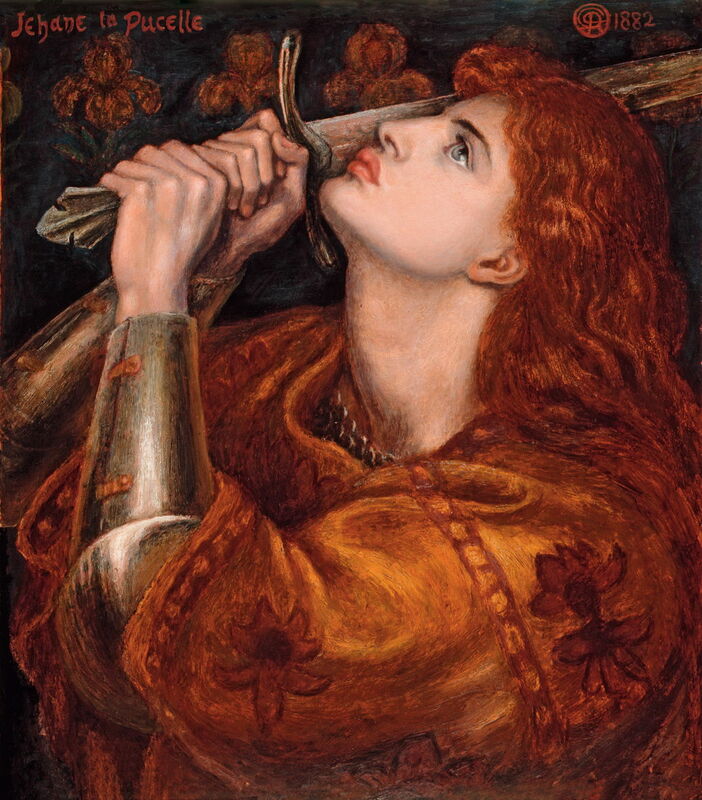 The image of Joan of Arc started to interest the Pre-Raphaelites in the UK too, with its mixture of romantic legend, the mediaeval, and a presumably beautiful woman. John Everett Millais put Joan of Arc (1865) into a very female and black suit of armour, and had her holding her sword and looking up to heaven. The artist gives no clues as to when in her life this was intended to represent: her face suggests it is a moment of reflection, perhaps awaiting divine guidance, but there is a touch of sadness in that face too. Millais’ limited range of colours helps make this a powerful portrait. Dante Gabriel Rossetti (1828–1882), Joan of Arc Kissing the Sword of Deliverance (1863), oil on canvas, 61.2 × 53.2 cm, Musée d’art moderne et contemporain de Strasbourg (MAMCS), Strasbourg, France. Wikimedia Commons. The first of Dante Gabriel Rossetti’s two paintings, this showing Joan of Arc Kissing the Sword of Deliverance and completed in 1863, slightly preceded Millais’. Joan is clearly kneeling at an altar – the candle, and feet from a crucifix are good clues – where she stares up and into the future, while pressing her lips to the sword. This is also one of the few paintings of Joan which shows her wearing jewellery. Dante Gabriel Rossetti (1828–1882), Joan of Arc (1882), oil on panel, 52.7 × 45.7 cm, The Fitzwilliam Museum, Cambridge, England. Wikimedia Commons. 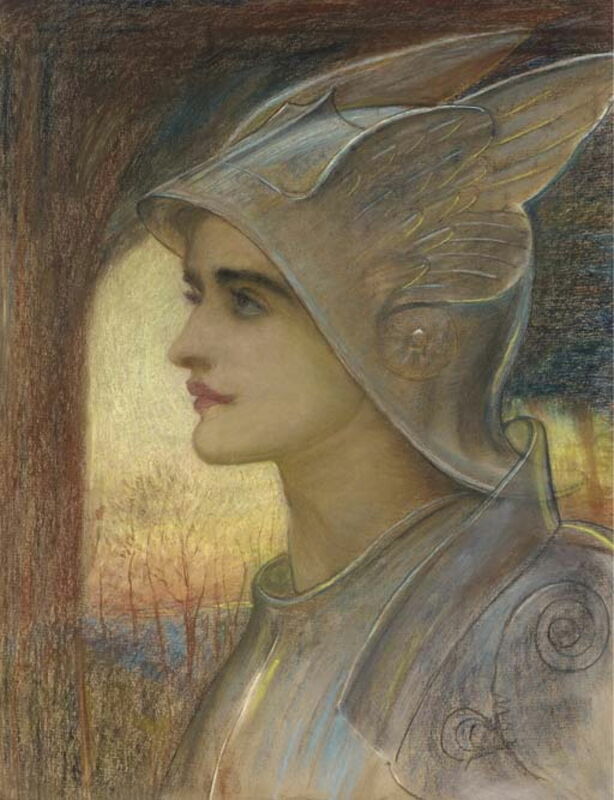 Rossetti completed his second painting of Joan of Arc just a few days before his death on 9 April 1882. 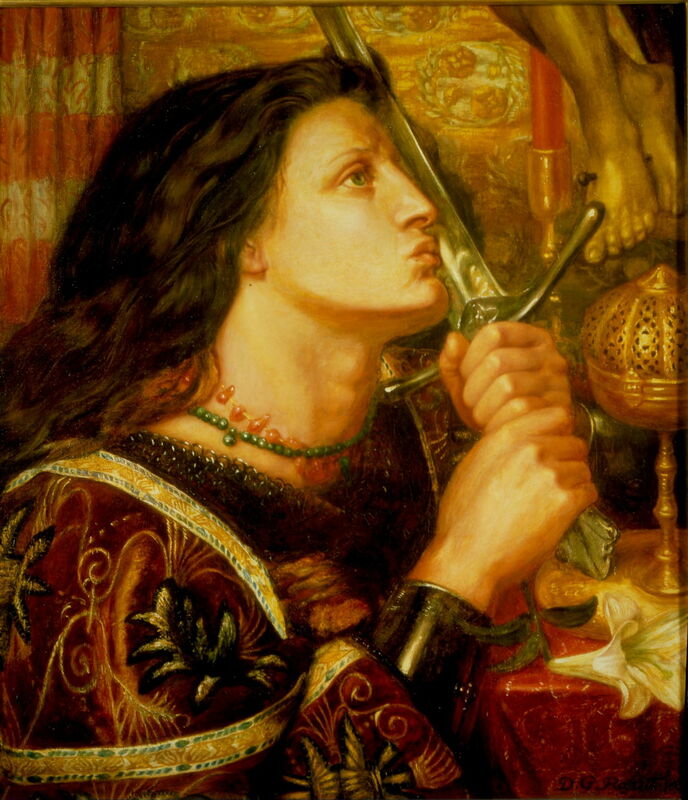 In recomposing his motif, Rossetti has dispensed with the location and jewellery, and here shows Joan – labelled according to her mediaeval nickname – with her heavy sword resting against the side of her face and head. Jean-Jacques Scherrer (1855–1916), Entry of Joan of Arc into Orléans (1887), further details not known. Wikimedia Commons. 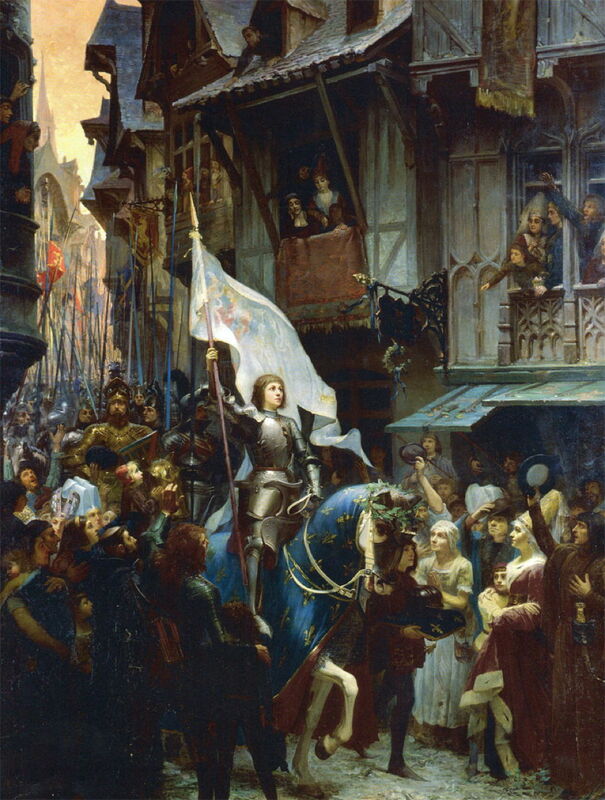 With revanchism moderating into national pride towards the end of the century, Jean-Jacques Scherrer painted the Entry of Joan of Arc into Orléans in 1887, so expressing an almost iconic view of her success. Although it has some historical basis, the reality seems rather more complex and less romantic. Soon after arriving at Orléans on 29 April 1429, a fleet of boats sailed from the besieged city along the River Loire to the French forces. These were loaded with supplies, Joan of Arc, and about two hundred French soldiers. The wind suddenly reversed after nightfall, blowing the boats back into Orléans. Joan entered the city, while it was still under siege by the British, at about 2000 that evening. After dark. Over the following days, Joan paraded periodically through the streets of the city to raise morale. She also tried to alter the tactics used by the city’s defenders. On 1 May, she left the city to survey the English forces, and finally left Orléans when the English allowed a strong French convoy to enter the city on 4 May. It wasn’t until 8 May that the English finally abandoned their siege and withdrew, allowing Orléans to start returning to normal again. Harold Piffard (1867-1938), Joan of Arc (date not known), oil on canvas, 91.5 × 72.2 cm, location not known. Wikimedia Commons. Harold Piffard’s portrait of Joan of Arc from about 1900 follows the contemporary conventions, showing her bearing a standard and wearing a fine suit of black armour. William Blake Richmond (1842–1921), St Joan of Arc (date not known), pencil and pastel on buff paper, 71.3 × 56 cm, location not known. Wikimedia Commons. William Blake Richmond’s pastel portrait of St Joan of Arc from about the same time is a contrast with its more symbolist approach. Joan’s face appears made up, with lipstick and honed eyebrows and eyelashes, and her armour fancifully faired and scooped into wings. 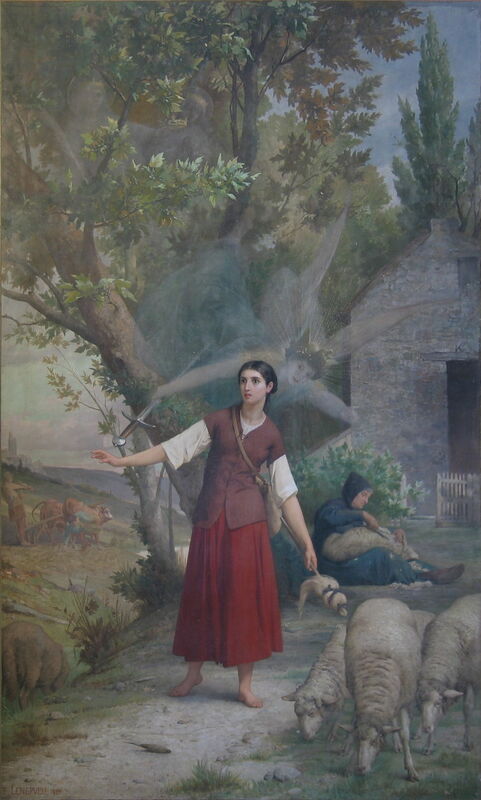 Annie Louisa Swynnerton (1844-1933), Joan of Arc (date not known), further details not known. Wikimedia Commons. 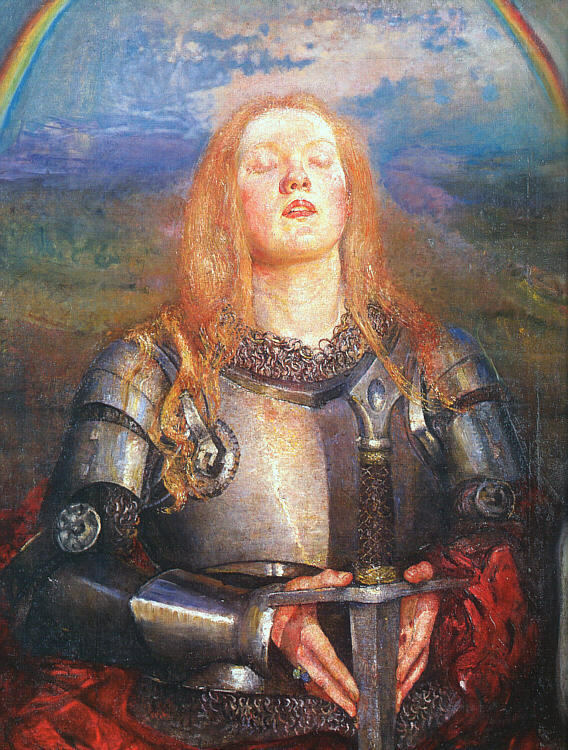 My final painting is, I think, one of the most moving and effective: Annie Swynnerton’s undated Joan of Arc. This combines the imagery of religious devotion, visions, and military service for God and her country. Unusually her eyes are not staring in shock, but closed. She is praying, a huge and heavy battle sword between her fingers. In the sky is a rainbow, a reminder of a much earlier covenant between God and man. After the execution of Joan of Arc in 1431, the war between England and France smouldered on for another twenty-two years. A posthumous retrial of Joan was then opened, and Joan was declared innocent on 7 July 1456. During the religious unrest in the sixteenth century, she became a symbol of the Catholic League, and in 1803 Napoleon made her a national symbol of France. It was not really until the nineteenth century that her case was pressed; the new Bishop of Orléans initiated a fresh campaign for her recognition in 1849, and she was finally beatified in 1909 – almost half a millenium after her execution. 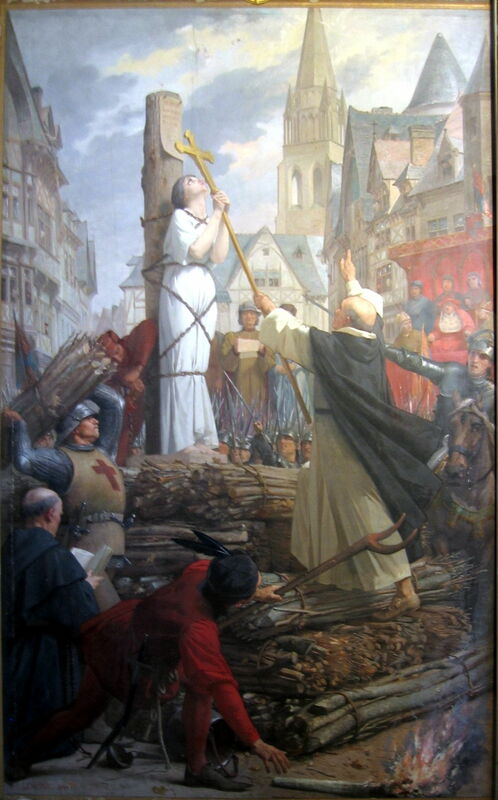 Over that period, the image of Joan of Arc has been used by the French nation, the Catholic church, Napoleon, revanchists, romantics, feminists, and many others. Sadly its most recent adopters have been some of the extreme right political parties in France. Such is the power of a story told in words, and in paintings. Posted in General, Language, Life, Painting and tagged Delaroche, Ingres, Lenepveu, Millais, narrative, painting, Piffard, revanchism, Richmond, Rossetti, Scherrer, Stilke, Swynnerton. Bookmark the permalink. Next Weeks on My Mac: Where to go with the log?